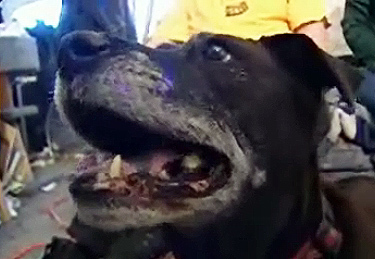 An Oregon man says he owes his life to the dog he adopted ten years ago. Danny Fincher suffered a massive heart attack and collapsed in a stairway in his North Portland home. His 15-year-old adopted dog, Ceili, pulled him down the stairs, and then ran upstairs to alert Fincher’s wife by barking incessantly. As a result, Ceili has been nominated for the Dogs of Valor Award issued by the Humane Society of the United States. Winners will be announced this Sunday, but there is still time to vote in the People’s Choice awards – voting closes today at 5p.m. EDT. Is this the world’s new oldest dog? I’ve often heard of this canine gift for detecting when a heart attack or seizure etc is about to occur. Pretty impressive. One more example of the wonderful love from man’s BEST friend. He looks like my Riley. One good turn deserves another. Your precious animal friends can be more dedicated than humans , These poor animals ,I hope someone will take them to a safe place.